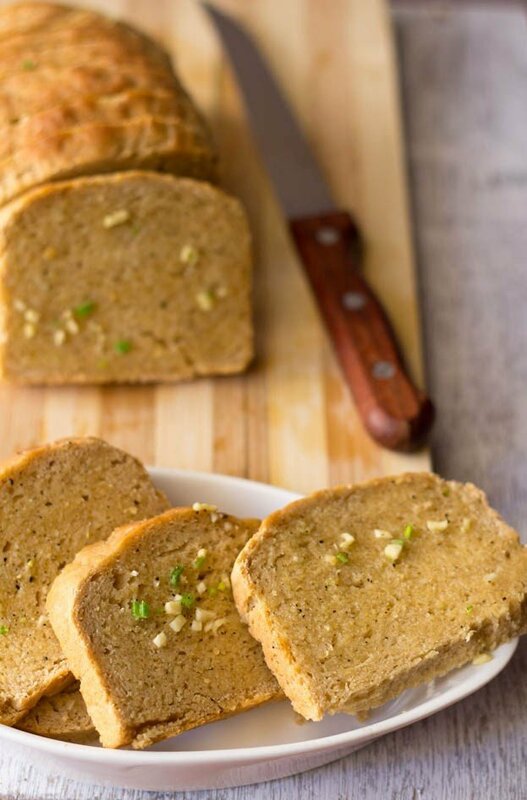 garlic bread recipe with step by step photos – this garlic bread was soft, light with a good garlic flavor and taste. 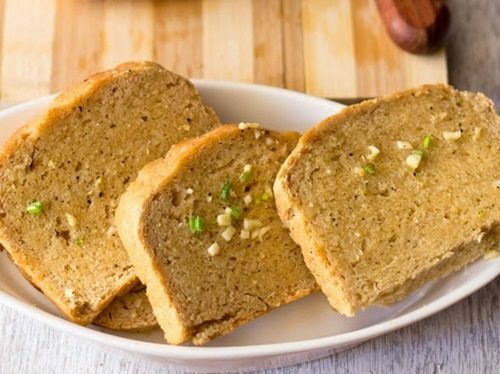 this is step by step recipe to make garlic bread from scratch. my first tryst with garlic bread happened when we as a team had made these for the first time in our home science cooking lab. one bite of the garlic bread and i was hooked. after that i made garlic bread many times at home. i would especially make these when i would make some soup, like tomato or minestrone soup. its one bread which my parents liked then and even now. the pics were shot in a hurry as this was one busy day with lots of cooking happening. 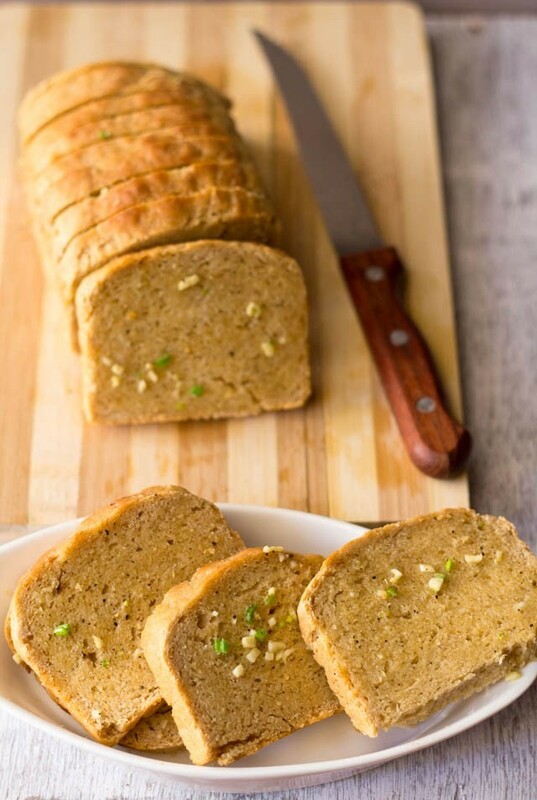 get again ready for a dose of pics to make this awesome garlic bread. 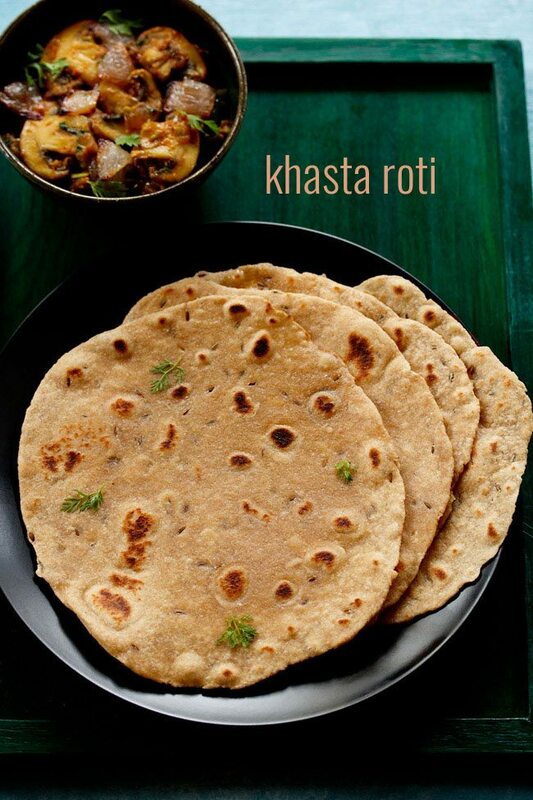 the bread is made with whole wheat flour and all purpose flour in the ratio of 2:1 respectively. you can also make the same bread with 1:1 ratio. its much better than the garlic bread we get in cafes or pizzerias. 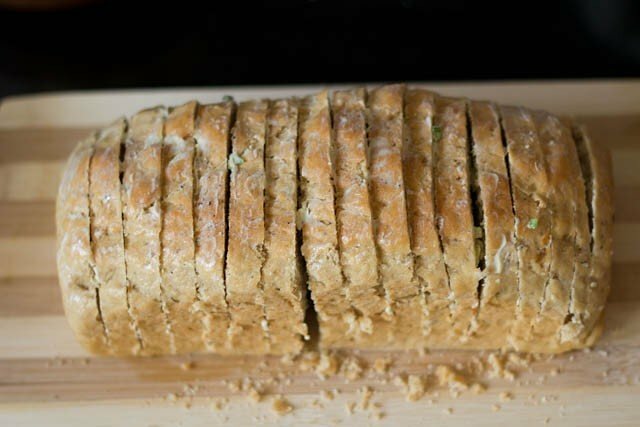 i even made garlic rolls later with the same garlic spread recipe that i used for this bread. 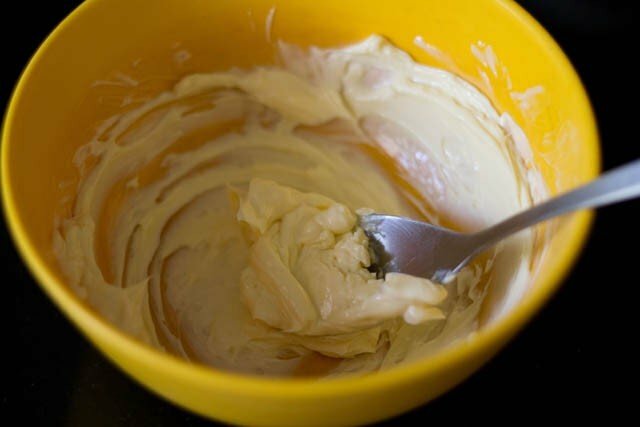 this garlic spread or garlic butter recipe is from my home science notes. i have not used butter here for the garlic spread. i used nutralite – its a table vegetarian spread and not hydrogenated. however, its not vegan as milk powder is added to the spread. as far as vegan butters are concerned, we don’t get them in india. atleast i have not seen them in any super store or food store. for cooking and baking, i generally use sunflower, sesame, rice bran or olive oil. there is dalda and margarine available. since both of them are hydrogenated fats, i don’t use them in cooking or baking. now if you are a vegetarian use butter and if a vegan than a vegan butter or spread, if you can get these in your country. note: this recipe is making the garlic bread from scratch and then filling the bread slices with garlic-butter spread. however, you can still make garlic bread without making the bread from scratch. just get some good quality bread or rolls from out. slice them and apply the garlic-butter. bake in the oven. in 20-25 minutes your garlic bread is ready. 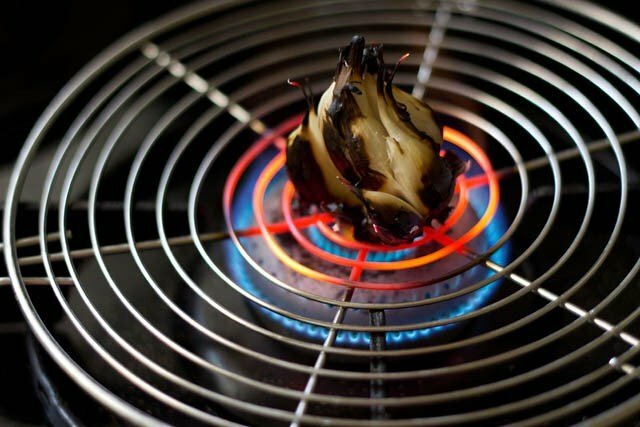 roast the garlic on stove top, grill or oven. peel when cooled and mash the garlic cloves in a mortar-pestle. keep aside. warm 1 cup water. stir 1 tbsp sugar in the water. add the dry active yeast. stir and keep aside for 10-15 mins. 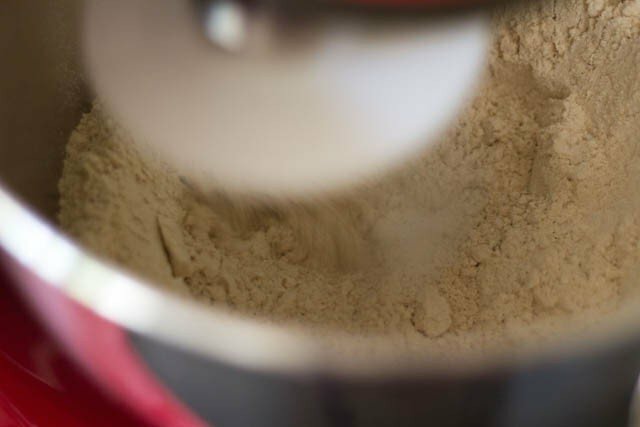 mix both the whole wheat & all purpose flour, salt in a bowl or in a mixer stand fitted with a bowl & paddle attachment. add the oil, mashed garlic and the yeast mixture. knead the dough with your hands or in the stand mixer. add some 1 or 2 tbsp water if the dough looks dry. 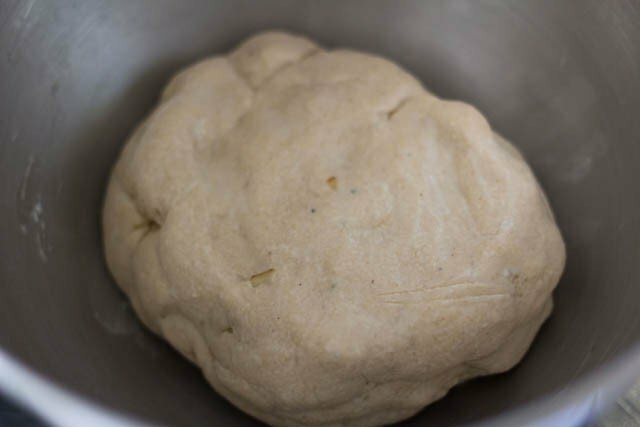 rub some water or oil on the whole surface of the dough. keep in a bowl and cover the bowl with a kitchen towel. let the bread dough leaven for 2:30 to 3 hours. on a work surface, dust some flour if required. punch the dough. roll into a log. seam the edges. 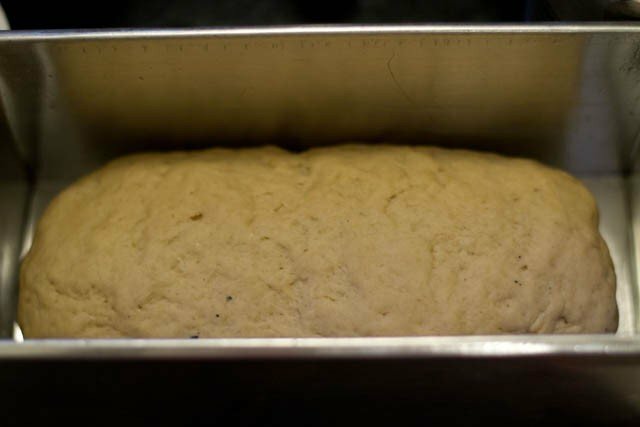 place the dough loaf in a greased loaf pan of 9 x 4 inches. cover and keep aside for 45 mins to 1 hour. if you want you can brush the bread with some milk. 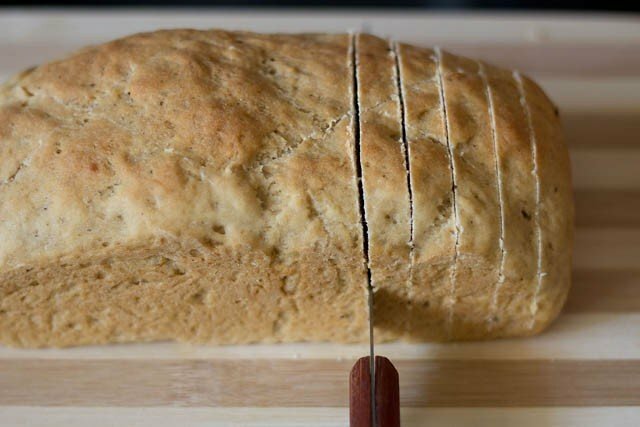 bake the bread in a preheated oven for 45 to 55 minutes for 180 degrees C.
remove the bread on a wire rack and let it cool completely before applying the spread. in a bowl take the butter or spread. 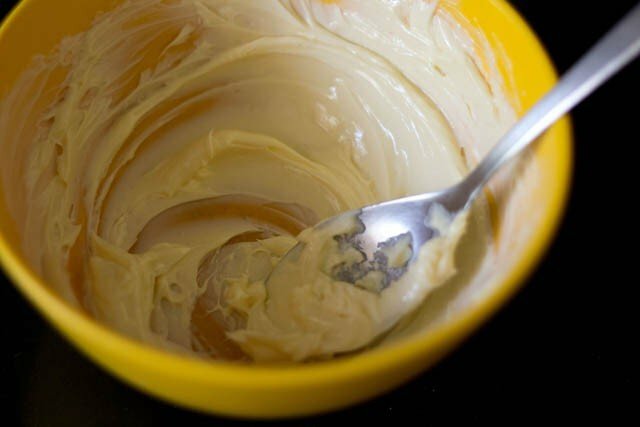 beat with a spoon or small wire whisk till the butter or spread has softened. add the chopped garlic, celery, black pepper and salt. mix and keep aside. slice the whole bread keeping the base intact. 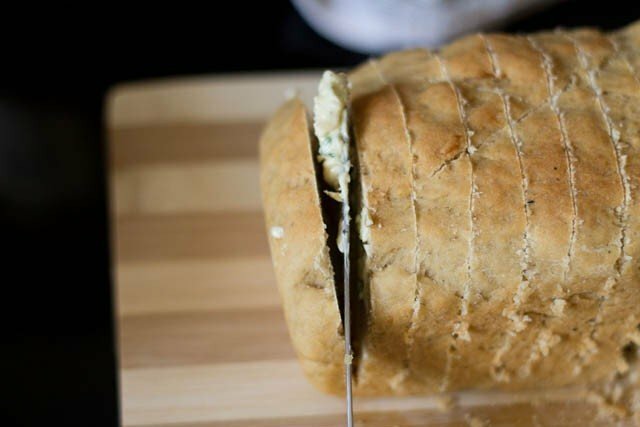 apply the garlic butter on each slice of the bread on both sides. apply also on top of the bread. 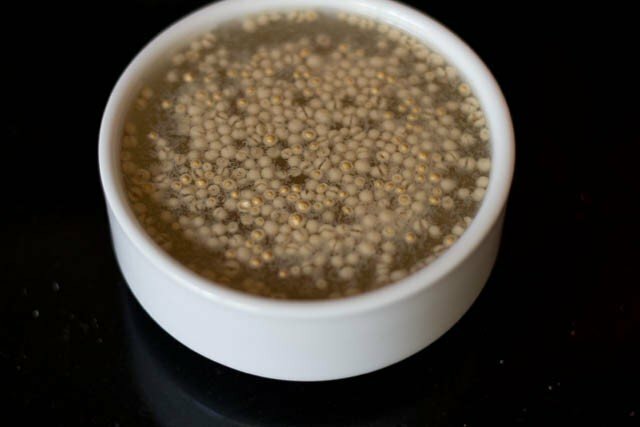 you can sprinkle the top with sesame seeds if you want. bake the garlic bread in the preheated oven for 12-15 minutes or till the butter melts. serve the garlic bread hot or warm. 1: i decided to roast the garlic bulb on fire for this garlic bread. you can roast it in oven or just use plain garlic. either mince the plain garlic or make a paste. 2: dunk the whole roasted garlic in water. 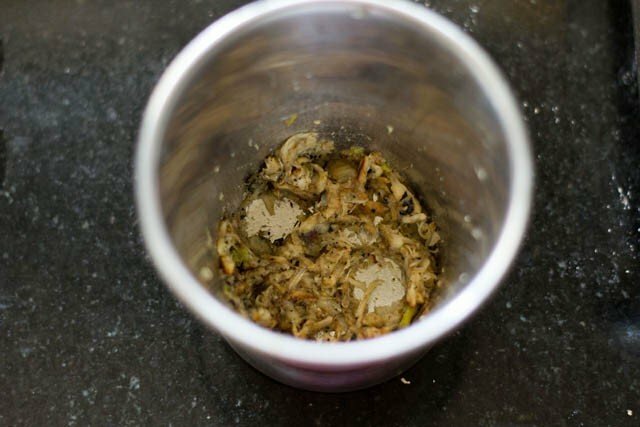 remove the peels when cooled and mash the garlic in a mortar-pestle. 3: warm 1 cup water. stir 1 tbsp sugar and add dry active yeast. stir & keep in a warm place for 10-15 mins. 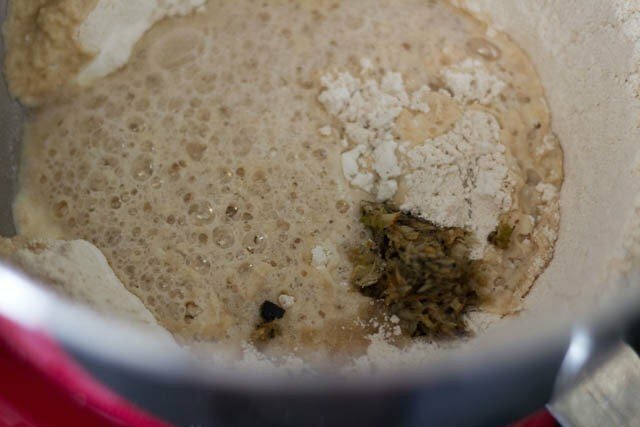 4: the yeast mixture bubbled up. 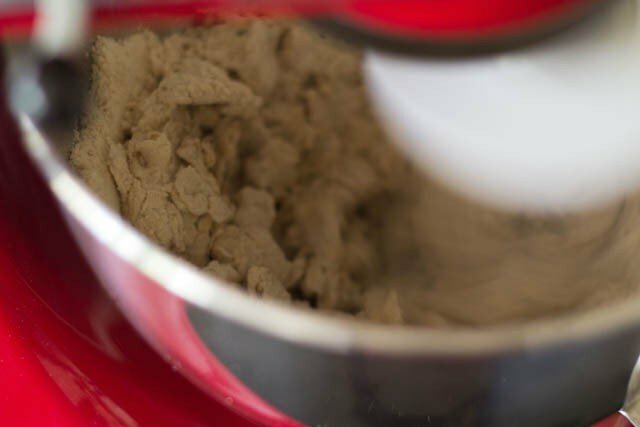 5: in a mixing bowl or in a stand mixer fitted with bowl & paddle attachment mix all the dry ingredients first – both the flours and salt. 6: add the yeast mixture, oil and the mashed garlic. 7: knead the dough either with your hands or in the stand mixer if using one. 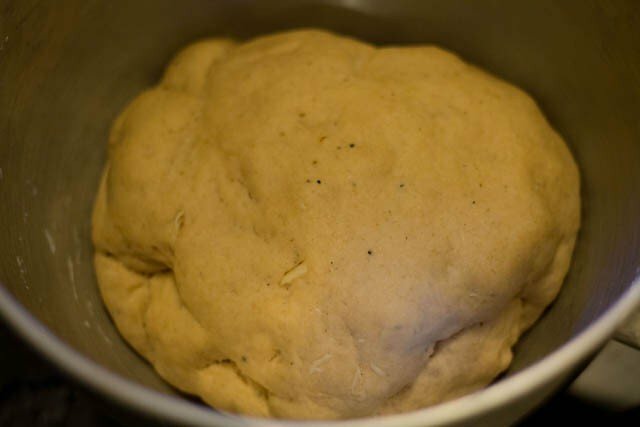 8: the dough should be soft and pliable. apply some water or oil on the whole dough with your palms. place in a bowl. 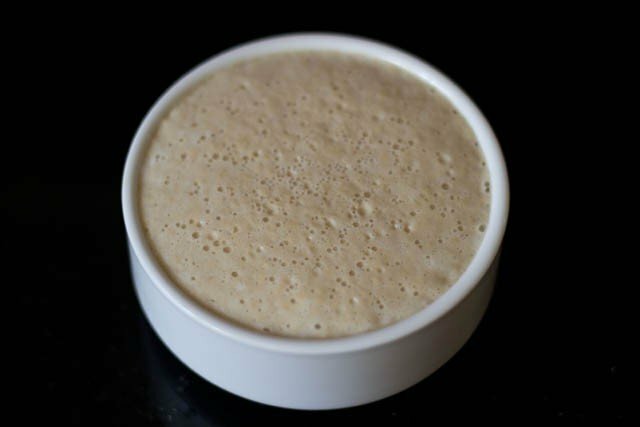 cover with a cling film or kitchen towel and keep in a warm place for the dough to leaven for 2:30 to 3 hours. 9: this is the leavened dough after almost 4 hours. 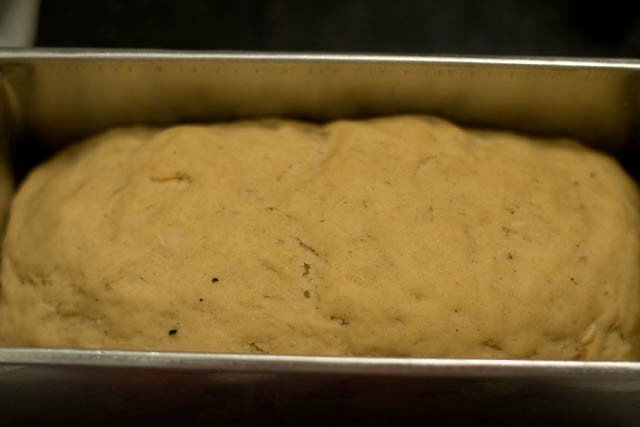 10: grease a 9 x 4 loaf pan with oil or line with parchment/butter paper. punch the dough. roll into a log shape. seam the edges and place the dough with the seamed edges below, in the loaf pan. 11: cover and let the dough rise for 45 mins or 1 hour or more if required. 12: bake in a preheated oven for 180 degrees C for 45-55 mins. i forgot to take a pic of the baked bread 🙁 once baked, let the bread cool down. cool the bread on a wire rack. 13: in a medium size bowl, take the butter and beat it. 14: since the quantity of the table spread was less, i chose to beat by spoon rather than using an electric beater. the butter should become light and fluffy. see the difference in both the above pic and this one below. 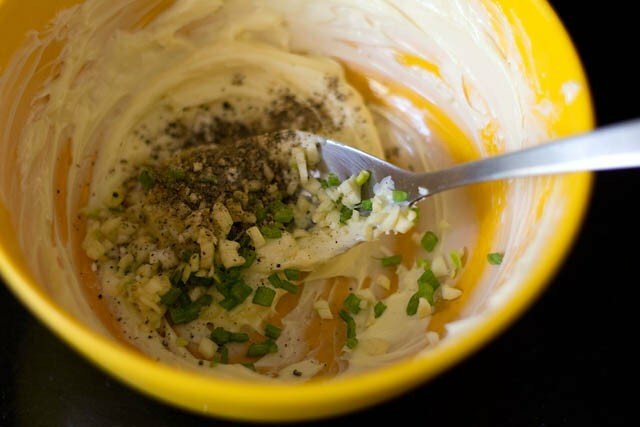 15: add the flavorings to the butter – garlic, celery, black pepper and salt. if using salted butter then no need to add salt. if you like cheese, you can also add some grated cheddar cheese or mozarella or parmesan to the spread. any type of cheese you like. 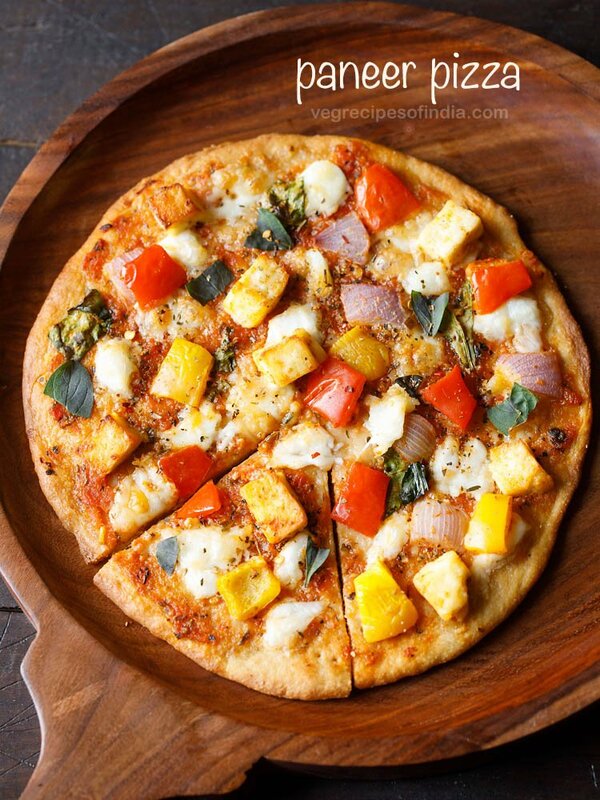 vegans can add some nutritional yeast to give that cheesy flavor. 16: slice the bread into equal width slices keeping the base intact. leave half inch space at the base of the bread. don’t slice through completely. this is bread removed from the fridge and hence it looks dense & dry. i did not even thaw it. 17: spread the garlic spread on the slices of the bread on both sides. 18: finish of spreading the garlic butter on all the slices. apply the remaining butter on top of the bread slices. 19: preheat the oven at 200 degrees C. bake for a further 10-15 mins. if you want to brown the edges, you will have to bake for some more time. 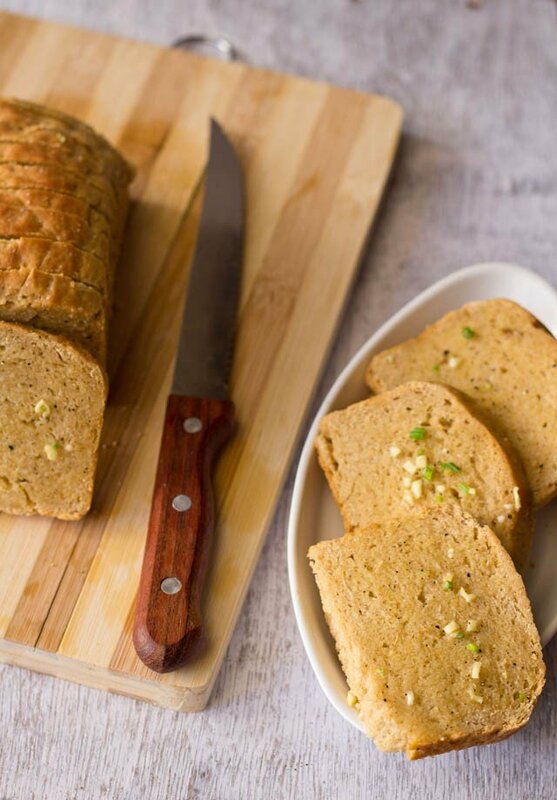 serve garlic bread hot or warm with a good creamy or heavy soup. these slices can also be had plain or they can be served with a pasta dish or as a starter. I followed all the instructions and the same measurements too. But couldn’t get the second proofing right after being shaped into log and so the baking too got affected. The top crust was very hard and also didn’t swell. What went wrong? 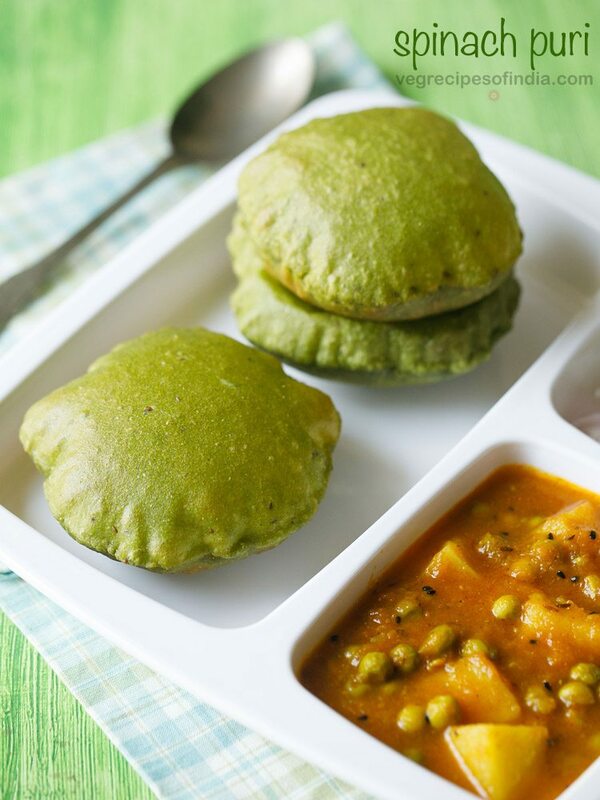 Can, using aashirwaad whole wheat flour makes this difference? did the bread proof well in the first round. meaning did it rise and double up. if the first rise has gone well, the second should also go well. which size pan did you use. the size of the pan also affects the rise and baking of the bread. also i hope the pan was at room temperature and not hot. while baking, the oven has to be hot. so a preheat time of 15 minutes is required, before you place the pan. crust can become hard due to a high baking temperature in the oven or baked for a longer time. Ok didn’t know that size of pan matters too. Its 12×4 inches. Quite a large size I guess. So may be I require double the quantity of dough? Yes first proofing was perfect and loaf pan also wasn’t hot. Baked in a preheated oven. okay. size of pan matters even while baking cakes. 12×4 inches is a large pan. depth wise is fine but width wise is large. a pan of 7×4 or 8×4 will work very well. for double the quantity you will need a larger pan than 12×4. what i would suggest is to buy a good loaf pan which gives a regular size of bread. Hi.. could u please tell how much instant yeast can I use instead of dry active one.as I’m more comfortable with it. 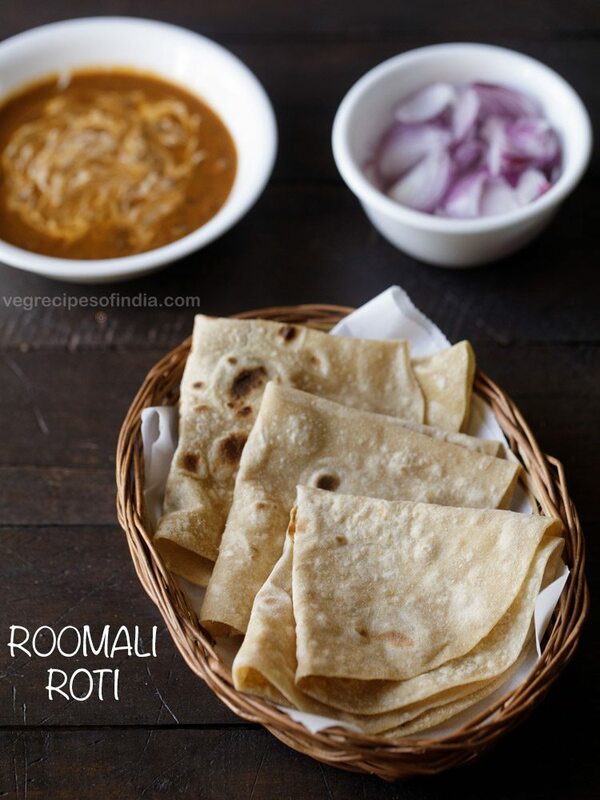 Thanks fr ur easy to make recipes…its a great help fr amateurs like me. add 1 tsp of instant yeast. thanks and welcome divya. I went through your recipe. It does take a lot of effort into making it. I need a little suggestion in this regard. Is there any other way of doing garlic bread? It need not be as authentic as i get in any cafes or pizzerias. After getting back home from work, if I want to make it, I really cannot afford to do this! Can you suggest an alternative to this – something quick and less time consuming? Hope you can suggest something.. Thank you for sharing that link! It seems much easier thing for me to do!! 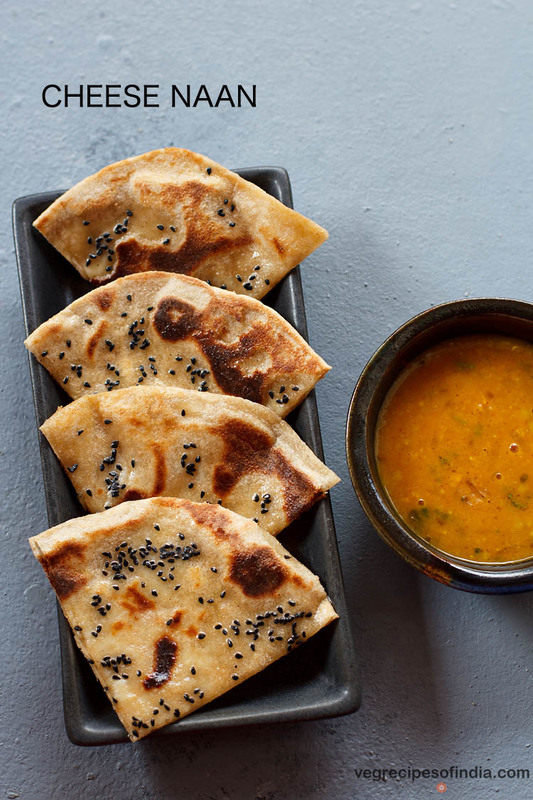 hetal, which yeast you used ?. i guess something has gone wrong in the yeast proofing. Thank you for sharing this recipe. I plan to try it out today. 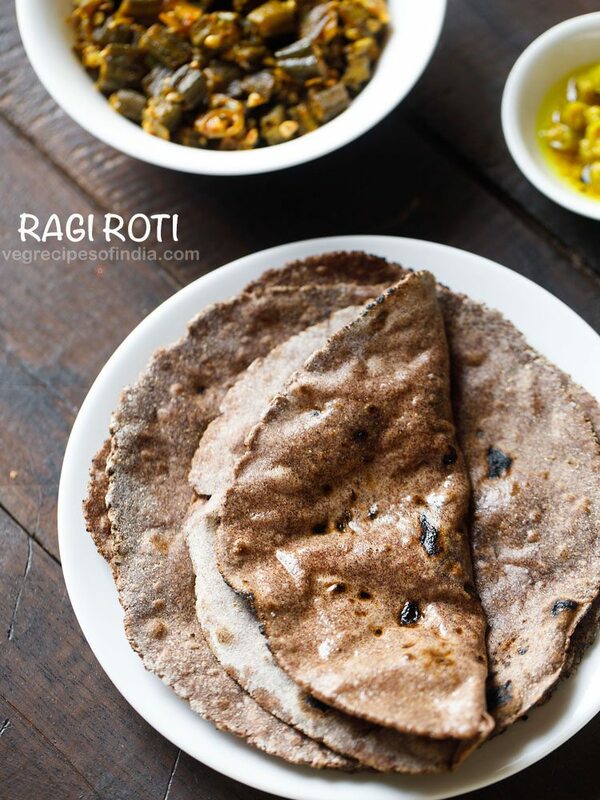 Had a question: can I use the whole wheat bread recipe instead of the one here, where you have also used maida? welcome ranjani. yes you can use the whole wheat bread recipe instead of this one. That was phenomenal.. I’ve always liked garlic bread and never did I know that I’ll be able to prepare it for myself and now my husband showered me praises after this.. Thanks a ton dasana and to mention I was already a fan of yours after trying the dum biriyani.. And now my husband turned your fan too..
welcome Ilakiya and big thanks for writing this positive feedback. do try some more recipes. Hi, firstly I’d like to say thank you for sharing this great recipe.I made it and it turned out great! Now, on a side note I’d just like to say that I couldn’t but help notice how dry and cake-like your bread looked. I’ve been baking for about 7 years now and I’ve been through the stage where my bread looks very dense and cakey nothing at all like the bread you can buy. I suggest you to use a little more water in your dough and knead it a bit more. The irregularities in the surface and the cakey crumb speak volumes about having been kneaded too little or having too dry a dough. thanks. and also thanks for sharing the tips. the bread looks dry, as i had refrigerated it. i did not even thaw the bread. i used it directly right from the fridge while applying the garlic butter (short of time). i know about the water tip and have even experimented some bread with extra water. Hi. Love this recipe, but I was wondering if I wanted to use only all purpose flour, would it be just 3 cups or do i lessen it? amber, you can use 3 cups all purpose flour but you might need less amount of water to knead it than the quantity of water mentioned in the recipe. Thanks a lot Dasna for sharing your very tasty tasty receipes. Phenomenal recipie. Turned out very well. Thank you Dassana. Also tried your pav, though with milk and added some tutti fruity to give it my son in his lunch box. Like all your other receipes, this one was a hit too. thanks shilpa for this sweet feedback about garlic bread and pav recipe. hello mam, i have made this bread twice and have got wonderful reviews. thanks a lot for sharing your recpie. i have a request if you could also teach to make submarines or subways(i dont know what to call them the one we get in Subway) from scratch like honey oatmeal or parmesan loaf etc..
hi meenakshi. thats good. i have heard the subways and submarines from subway some years back. i need to get a subway menu to see what they offer now 🙂 will check and see. Love it a lot, superb recipe. I’m guessing that’s a red KitchenAid standmixer? Because I have the same one! Love this garlic bread. Must taste delish! yes kiran, it a red kitchenaid stand mixer. The first thing which caught my eyes was, the burning garlic! – Wow, you have captured it beautifully. Graceful pictures of the bread!! Also the step by step preparation photos are ultimate. Healthy one ! i generally prefer wheat flour def i wll try !